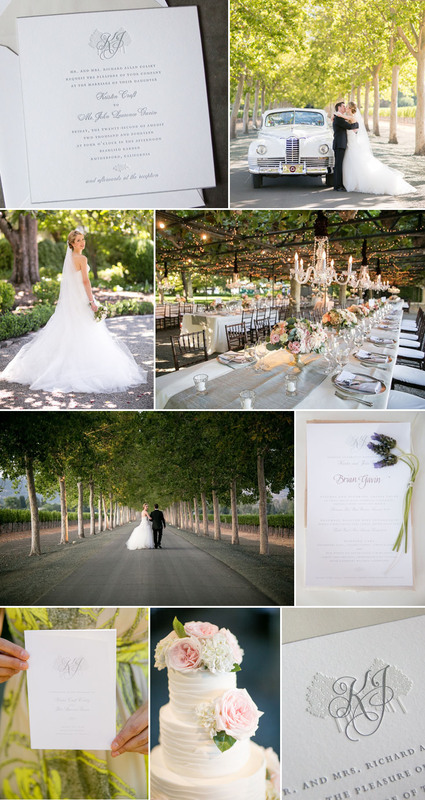 Beaulieu Garden is known for it’s incredible grounds and elegant setting in Napa County. Their tree-lined entry is jaw-dropping and noteworthy (and also the perfect backdrop for wedding photos), so we wanted to highlight this feature in the invitation design. We created a romantic, yet traditional monogram for Kristin and John and printed that in dark gray upon a softer gray letterpress illustration of the trees. The bevelled edge painted in gray and the soft gray envelope liner helped bring the entire invitation suite together. JBD Events and Atelier Joya really brought this sweet and traditionally elegant garden wedding to life with some added tones of blush and soft, natural greens.